Successfully Added Astonishing 3.4 Inch LCD Car DVD with TV Tuner and USB to your Shopping Cart. Do you need to pack all the features you can into a single DIN slot? 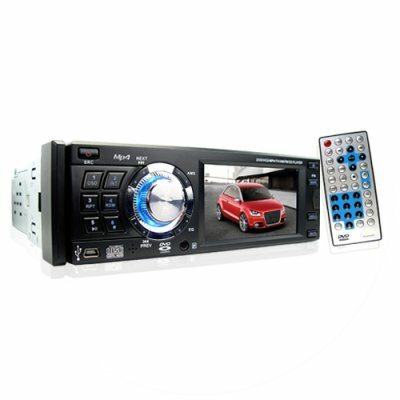 With DVD movie playback, USB and SD Card Readers and Analog TV tuner you're certainly on the right track with with this astonishing single DIN 3.4 Inch LCD unit. A detachable face plate will hide its true potential when not in use and the electronic anti shock buffer system will ensure your movies are music are smooth and skip free. Easily watch downloaded movies buy burning them to DVD or CD or simply put them on your flash drive or an SD card, and the TV tuner can keep you up to date with all your favourite shows on the road also keep in touch with the handy Bluetooth function. A truly astonishing unit at a great Chinavasion wholesale price, purchase today and get it shipped directly to your door from China.. This dvd player is really outstanding quality given its price. Sound quality is great and the tft screen is the best i have seen in this type. You won't miss the touchscreen function. Radio does not support RDS but no one will miss it. I am very, very satisfied.